Igor Mordatch is helping computers develop their own language, for use in talking with each other. Born in Ukraine and raised in Toronto, the 31-year-old is now a visiting researcher at OpenAI, the artificial intelligence lab started by Tesla founder Elon Musk and Y combinator president Sam Altman. There, Mordatch is exploring a new path to machines that can not only converse with humans, but with each other. He’s building virtual worlds where software bots learn to create their own language out of necessity. As detailed in a research paper published by OpenAI this week, Mordatch and his collaborators created a world where bots are charged with completing certain tasks... The world allows the bots to create their own language as a way collaborating, helping each other complete those tasks. "Fine! Well, get started on the other things, then." "Yes, sir," said Henry, and assumed the curious absent look of a robot talking on the TBR circuits - the Talk Between Robots radio - as it arranged the appointments for its master. 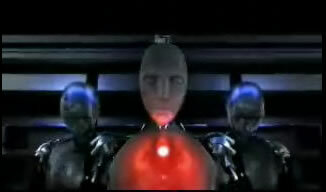 I really liked the 2004 movie I, Robot; the advanced NS5 robots had a special feature. Additional software and instructions could be downloaded wirelessly to individual robots. NS5's receiving a download show a red glow in the chest cavity.